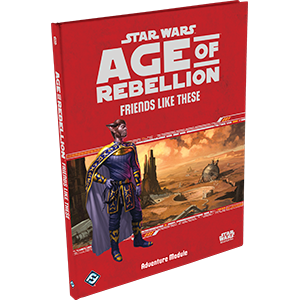 Time is running out for the planet Xorrn in Friends Like These, an adventure supplement for the Star Wars�: Age of Rebellion� roleplaying game. When intelligence reveals that an important and secret shipyard is under threat, the player characters have two days to arrange the planet�s defense and recruit allies in the region before Imperial forces arrive. Friends Like These takes players to a new sector where they encounter Mandalorian culture and face a brutal moral decision regarding who the Rebel Alliance should call friends. Within the 96 full-color pages of this supplment, players and game masters will find gazetteers for three new planets, countless NPCs, and directions for creating playable human characters of the Mandalorian culture.